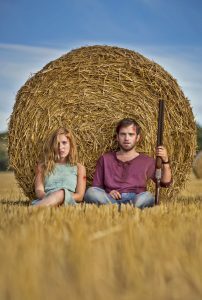 Road Games is a psychological thriller set during an idyllic summer in France where drifters Jack (Andrew Simpson) and Véronique (Joséphine de La Baume) hook up and hit the road. Hitchhiking a lift from a local oddball, who takes them home to his wife, where they suddenly find themselves in a deadly game of cat and mouse.. The film was written and directed by Abner Pastoll (Me or the Dog, A Great Mistake) and stars Andrew Simpson (The Life and Adventures of Nick Nickleby, Notes on a Scandal), Joséphine de La Baume (Rush, One Day), Barbara Crampton (The Young and the Restless, We Are Still Here) and Frédéric Pierrot (Young & Beautiful, Polisse). The Anglo-French co-production filmed in Kent for around 4 weeks in July and August 2014 using St Clere Estate, Markbeech, Castle Farm, Falconhurst and Kemsing roads, doubling as France. St Clere Estate is set across 2,800 acres of the rolling Kent countryside, offering stunning views of the North Downs. The house itself was built in 1630 and has some fine architectural examples of the Caroline era. St Clere Estate has been previously featured on screen in The Mirror Crack’d (1980). Falconhurst is a 700 acre country estate just 45 minutes to central London. The location boasts farmland, woods, private roads, farmhouses and cottages. Falconhurst has been used for filming by a variety of projects including short films, photoshoots and the Kent Film Office Promotional Film. Castle Farm is a farm in Sevenoaks with a timber-framed farmhouse and oast surrounded by stunning lavender fields, pasture, woodland, stream, farm shop, barns and outbuildings. The site has been used for filming by Darwin’s Dangerous Idea (2009) and various photoshoots. Road Games has its UK theatrical premiere on Friday 26th August and will be available on demand and DVD release from Monday 29th August 2016. This entry was posted in Filmed in Kent and tagged Abner Pastoll, Andrew Simpson, feature film, psychological thriller, Road Games film locations. Bookmark the permalink.